HamSphere is pleased to present the 7-Element Diamond Configuration Cubical Quad HF antenna series which is optimized for superb DX performance. This mono-band antenna is deployed on all HF Ham Radio bands on HS4. Those who have worked with Cubical Quads (even 2-3 element versions) before would appreciate the inherent characteristics and remarkable performance of Quads. 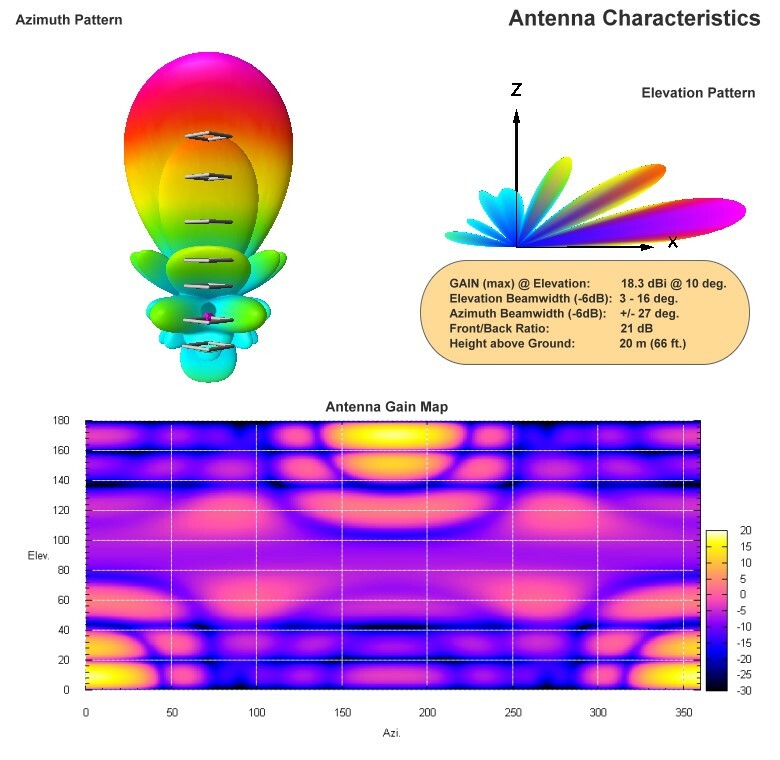 This specific antenna on HS4 features excellent gain (18+ dBi at the top), low takeoff angle, broad azimuth beam, smooth forward lobe, minimal spurious lobes and good Front to Back (F/B) ratio which is typically 23dB. HamSphere 7-el Cubical Quads antennas are hoisted at various optimal heights above ground depending on the band of operation. Higher frequency band versions are at 20m above the surface of ground whereas the 160m band version of this antenna is hoisted to 40m height. By virtue of its design a Cubical Quad antenna has fewer spurious lobes thus producing a neat forward main lobe devoid of any prominent inter-lobe nulls. 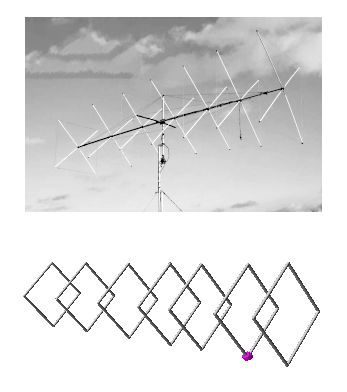 Yagi-Uda antenna has the shortcoming of producing several inter-lobe nulls along the elevation section when placed in proximity to the Earth’s surface, whereas the Cubical Quad radiation pattern has far better integrity thus making the performance of Quads far more stable and superior to that of the Yagi. HamSphere 7-element Cubical Quad series of antennas have excellent DX capability coupled with a good mid-range performance. We expect this antenna to be a connoisseurs’ delight by providing excellent communication capability under extensive variations in propagation conditions.